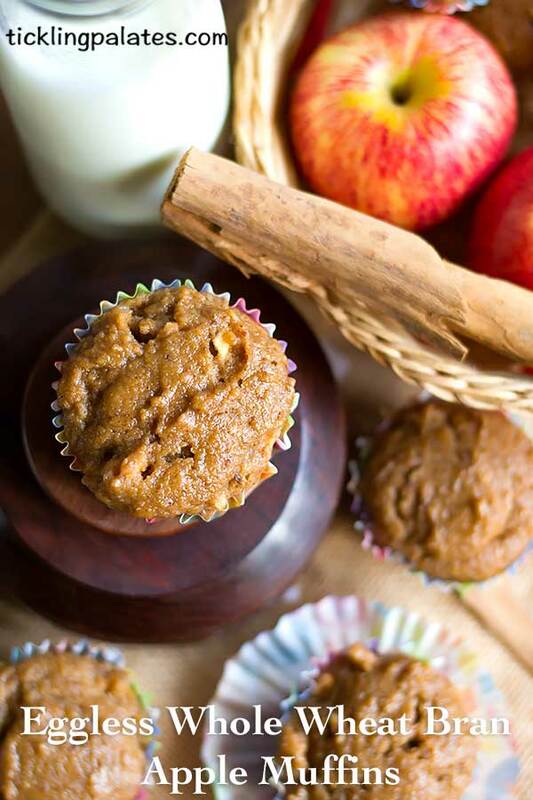 Eggless Whole Wheat Bran Apple Muffins with stepwise photos. An amazingly soft and moist muffin with your daily dose of fibre and omega 3 fatty acids for your ready to grab and go breakfast or snack. I have used organic products from 24 Mantra Organic as a part of Organic Mantras to bring in the awareness about going organic and helping farmers who grow them and the consumers like us, to live an organic life. This is the first time I’m using Wheat Bran, I just followed my basic muffin recipe and baked a test batch of these muffins and it turned out to be a major disaster. Saying that these were hard will be an understatement. So to get a better understanding of how wheat bran worked, I added some in the regular whole wheat flour and made them into parottas which I posted in Instagram where I loudly complained how difficult and hard I found it to roll. 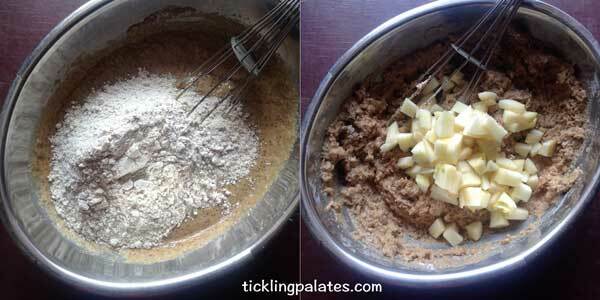 My good friend Natasha (thegutlessfoodie) gave me a good tip about using curd to soften bran. So the second time, I added curd and baked a test batch. Well, the muffins turned out Okay, at least they were not rock hard, but they were not as moist as I wanted and the texture was very coarse. My elder one commented that it was like eating sweetened saw dust and that there were few small lumps here and there which was way too chewy. So the third time, I got an understanding of what I needed to do, to get it right. I felt that since the wheat bran is of the same texture as that of flax seed powder, I decided to give it the same standing time that I would give the flax seed gel. So I soaked the wheat bran in liquids and let it rest for 15 mins which made a major difference. I also did not add baking soda, replaced regular sugar with brown sugar, changed the step where I would usually add vegetable oil and blended the soaked wheat bran which not only softened it further but also it got rid of chewy lumps and made a tremendous improvement to the texture of the baked muffins. They were as soft as the regular muffins. I showed the entire procedure in Instagram Stories, so if you are not following me on Instagram, then you are missing out on daily happenings in my kitchen. Any Apple will do for this recipe. The first and second time I used Fuji Apples and in this one I used Royal Gala. You can leave the skin on for added fiber and nutrition but with the Apples coming with a wax coating now-a-days, I was not going to take a risk, so I peeled the skin off the apples before using. 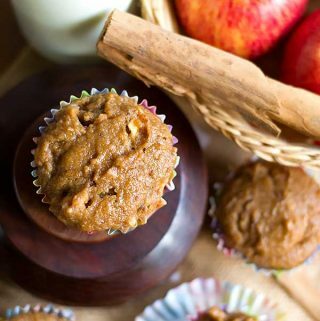 Despite using whole wheat flour along with wheat bran, which are known to make muffins chewy and dense, these eggless whole wheat bran apple muffins turned out to be as good as the regular muffins. So, I would strongly recommend that you follow the procedure exactly in order to get soft and moist muffins. 1. In a small bowl, mix together flax seed powder and warm water. Let it rest for 15 mins. 2. In a mixing bowl, stir together wheat bran, yogurt, vanilla extract, milk and let it rest for 15 mins. 3. In another bowl, whisk together whole wheat flour, salt, baking powder and cinnamon. Keep aside. 4. Peel, core and dice apple into small cubes. 5. In a blender, add the flax eggs/flax gel mixture, softened wheat bran mixture, vegetable oil and pulse at regular intervals for 8 to 10 times. 6. Transfer the batter to the mixing bowl. Stir in both Demerara Sugar and brown sugar. 7. Add whole wheat flour mixture mixing just until it gets incorporated. Do not over mix, else, you will end up with dense and hard muffins. 8. Fold in diced apples and stir to distribute evenly. 9. Scoop the batter into the prepared muffin cups. 10. Bake for 35 – 40 mins or until a skewer inserted comes out clean. Keep checking after 30 mins to avoid over baking which will make the muffins hard. Let it rest in the pan for 5 mins before transferring to a wire rack to cool down completely. 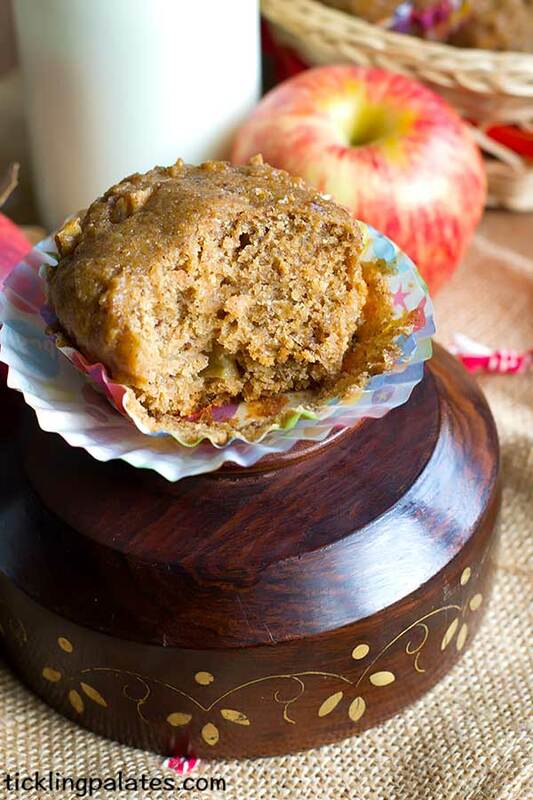 Eggless whole wheat bran apple muffins are ready for your breakfast or snack. 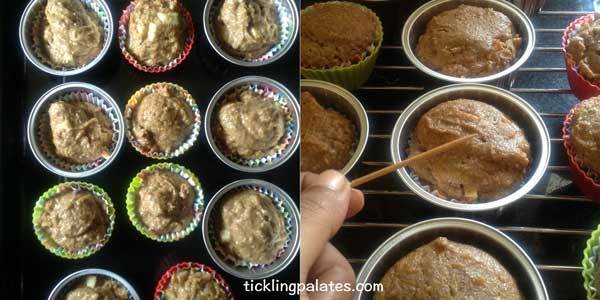 These muffins taste even better from the next day onwards with all the flavours getting merged well. Though they stay well in room temperature. 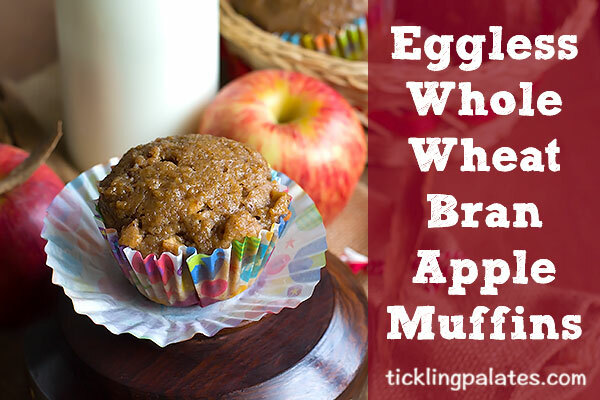 If you do not like to use wheat bran in muffins, then you can check out this Eggless Apple Banana Muffins which are insanely delicious. A fully loaded eggless muffins that is made using whole wheat flour, wheat bran, flax seeds and apple that is perfect for your breakfast. Preheat oven at 180 C / 350 F degrees. Grease a 12 holed muffin pan with oil or line with paper liners and keep aside. Peel, core and dice apple into small cubes. In a mixing bowl, stir together wheat bran, yogurt, vanilla extract, milk and let it rest for 15 mins. In a small bowl, mix together flax seed powder and warm water. Let it rest for 15 mins. In another bowl, whisk together whole wheat flour, salt, baking powder and cinnamon. Keep aside. In a blender, add the flax eggs/flax gel mixture, softened wheat bran mixture, vegetable oil and pulse at regular intervals for 8 to 10 times. 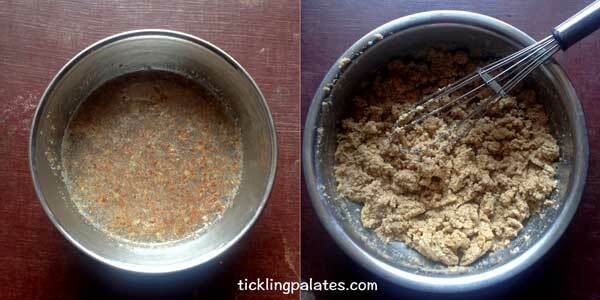 This will make sure all are combined together without any lumps and also the texture of the bran will turn soft. Transfer the batter to the mixing bowl. Stir in both Demererra and brown sugar. 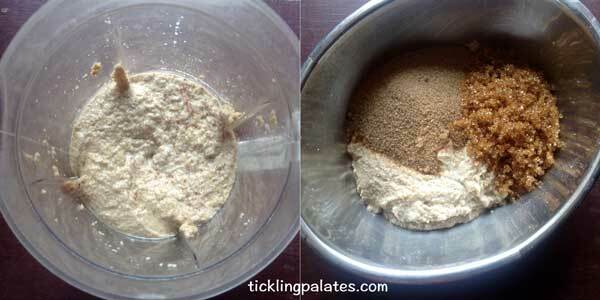 Add whole wheat flour mixture, mixing just until it gets incorporated. Do not over mix, else, you will end up with dense and hard muffins. 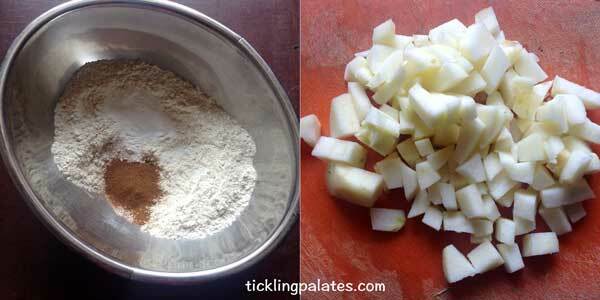 Fold in diced apples and stir to distribute evenly. Scoop the batter into the prepared muffin cups. Bake for 35 - 40 mins or until a skewer inserted comes out clean. Keep checking after 30 mins to avoid over baking which will make the muffins hard. Let it rest in the pan for 5 mins before transferring to a wire rack to cool down completely. 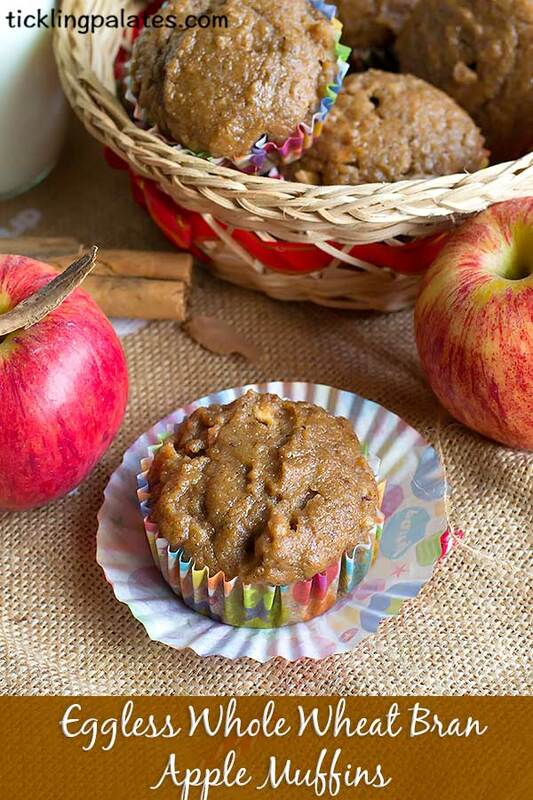 Eggless whole wheat bran apple muffins are ready for your breakfast or snack. These muffins stay well at room temperature for 2 to 3 days and they also freeze well. Just pop into the microwave for 10-15 seconds to warm them up before serving.